Sony Computers has launched their new Sony X Series Walkman which is fully loaded with amazing features like touchscreen, Wi-Fi and some great music tracks to get tuned into. It is currently available in two models X106 and X105. The main difference between both of them is their capacities. The Sony X106 comes with a 32GB capacity while the X105 comes with 16GB capacity. Sony X-Series Walkman series comes with a 3″ OLED (Organic Light Emitting Diode) touch display screen so the users can view their memorable pictures, surf the internet on an amazing bright light crisp clear screen. 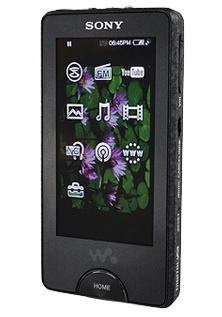 The touch screen facility of Sony X Series Walkman provides the users with one touch easy navigation to their desired music, videos or photos. Sony X Series Walkman is also equipped with a built in Wireless connection facility which enables the users to surf their favorite sites, download songs or even subscribe to various podcasts. Users can easily subscribe to the podcasts with the help of the RSS button provided for easy access. The prime feature of all in Sony X Series Walkman is the amazing digital clear audio which is equipped with latest technologies like the S-master digital amplifier system and noise cancelling facility. Now the users can experience some sensational music without any distortions. Sony X Series Walkman comes along with Premium Ex noise headphones for an unmatched sound quality. That’s not all! Sony X Series Walkman also gives a startling battery life of 33 hours of non-stop music and up to 9 hours of video. Sony computers with the launch of their Sony X Series Walkman have certainly revolutionized the generation of MP3 players and are making a big comeback in the market.